Kids Count Minnesota invites you to have coffee and learn the latest statistics on children in our state and specific counties. This community forum will include legislative updates and discussion on how to improve the lives of children in our area and beyond. 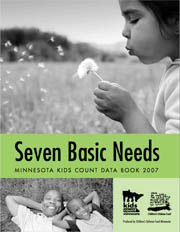 Attendees will receive a free copy of Seven Basic Needs: Minnesota Kids Count Data Book 2007. June 19, 10:30 a.m.-12 p.m.